Metroplex Tech provides new home wiring services the entire DFW Metroplex. 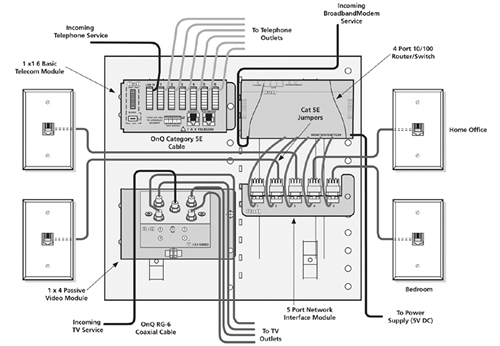 Below is more detail about our specific wiring solutions. The drive for better communication is now causing a change in how phone lines are cabled within new homes being built. Today the latest structure cabling techniques are being employed. Unshielded Twisted Pair (UTP) cable, typically Cat5e or Cat6, is run from each of the phone outlets back to a central wiring control panel. This central panel is then connected onto the master dmark, provided by the phone company, by a single run of network cable. The latest way to distribute video signals around your house is by structured cabling, typically Cat5e or Cat6. It is now possible to distribute high quality (SVideo) video, digital audio, analogue audio and 2 way infra-red signals all down a single Cat5e cable. Some people prefer to also include a standard TV or a satellite connector in each room so a TV or Satellite device can be connected directly. This is done by running RG6 coax cable back to a central location. TV signals are distributed by using a standard RF video splitter however for satellite distribution a Satellite Multiswitch must be used. The Multiswitch is connected to the Satellite dish with 2 RG6 cable runs and a dual LNB is required on the satellite dish. Residential data networks are becoming increasing important thanks to the internet revolution and more people working from home. Wired networks offer higher bandwidth, better security, faster and more reliable networks than the WIFI wireless counterparts. A home data network allows for high speed internet connection sharing, printer sharing, game play and even video distribution from security cameras. The cables should be run back through the structured cabling onto an Ethernet switch which will allow all the network devices on communicate to one another. While 100Mb networks are now the norm, it is possible to run Gigabit networks and for this reason we recommend you wire your house using Cat6 cabling and terminations which support higher data transfer rates. For a typical room you would expect to have at least 2 data outlets on opposite sides of the room, each co-located with a phone socket. In offices and near home cinema equipment increase this number by up to 4. There are a variety of techniques to wire your property for surveillance. Standard CCTV cameras typically require RG 6 coax cabling to be run back to central location. Multiple cameras are then connected onto a video sequencer which will typically cycle through each of the security camera in turn. This output is then connected onto your house distribution system allow you to view it on any TV or computer screen around your house. Other security cameras are connected in a similar fashion but use standard Cat5e or Cat6 cabling rather than RG 6. The latest generation of IP web based cameras simply need to be connected onto your data network by running Cat5e or Cat6 back to your network hub over the structured cabling, these have the advantage that you can use a web browser to view and remotely control the camera from anywhere in the world. Normal structured audio cabling requires for speaker cable to be run from each of the speaker locations back to a central location. In these circumstances special in-wall speaker cables should be used to counteract the long runs that are often required and to minimize interference and distortion. Termination units can be place near to where the speaker will be mounted to allow for each connection and removal of the speaker as required. Even if you don’t intent to use a multi-room audio system, consider pre-wiring the main room for home cinema speakers. In these cases, wiring should be run for up to 9 speaker locations to allow support for the latest audio coding standards and of course the ultimate movie experience in complete surround sound. Wiring considerations for a Home Cinema system typically consists of speaker, high quality video and blind/screen control cables. These can either be wired back to a central location in the room or to a central location in the house, if the equipment is required to be out of view. For the best quality video connections Component, RGB or DVI cables should be used. Plasma, LCD and HDTV screens and projectors will often require a serial cable to be run back to the central location so the device can be controlled remotely. Depending on the video sources and the way in which they are switched by your system, it is possible that you may require multiple video cables to the tv or projector to support the different video standards such as composite video, RGB, S-Video, DVI and Component. Professional video cables should always be used in Home Cinemas to ensure the best possible picture quality is achieved. There are many way to implement whole house infra-red distribution. 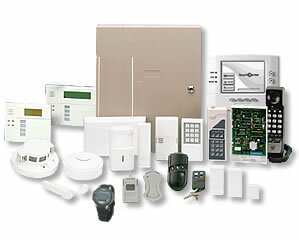 The most common is to use the functionality provided with most home controllors. In these systems the infra-red signals are routed over the home controllers cabling system. It is possible to buy seperate infra-red transmitters and receives that can be mounted in each room. These typically should be wire back to your central location using Cat5e cabling. Most security products such as movement detectors, door sensor and pressure mats are wired using the standard 6 core security cable. Many people now choose to use Cat5e cable instead to standardize the cabling throughout the house. These cables should all be wired back to a central location where the security alarm system will be located. It is not uncommon for a modern automated home to have several miles of wires and cables circling around the property. Its quite easy to see how this could soon turn into a lot to manage - if it is not kept well organized. All cables runs should occur in ducting or pvc to both protect the cables and allow cables to be easily pulled through later, if needed. Insulating should also be used to ensure that data and power cables have the appropriate degree of protection to prevent cable crosstalk. If you have any questions about our various House Wiring options for your house please Contact Us or give us a call at: (214) 685-0886.